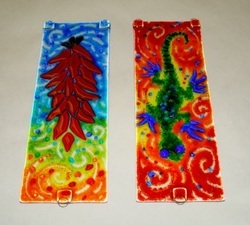 Browse our extensive "Glass Buffet" to select sheet glass colors, shapes and frit for creating one or two 10" Suncatchers in this really fun one day class. If you enjoyed our BirdBells or Fused Plate Classes, you will truly love this one, too! Choose from a dozen designs including Hummingbird, Sunflower, Dragonflies, Fish, Birdhouse and Southwest themes. Option: You can add beads and a bell to finish off Suncatchers at home.